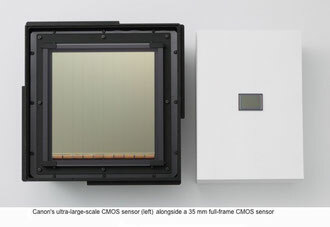 Canon introduced the world biggest CMOS sensor. It seems that they are working on something might be striking someday but not tomorrow. They just introduced 120 mega pixel APS-H CMOS sensor a couple weeks ago. I think the one is not also something for tomorrow. I am wondering what the company is looking at. The shape and size is not convenient for a camera. I am wondering it could be used for satelite telescope or some kind of military instrument. Anyway, the company is not looking at something that a good old camera company would be looking at.